Hess was born on May 27, 1906 in New York City. He received a Bachelor of Science degree from Yale in 1931 and a Ph.D. from Princeton in 1932. Upon graduating, Hess taught for one year at Rutgers University and then spent a year as a research associate in the Geophysical Laboratory of the Carnegie Institution of Washington. In 1934, Hess became a professor at Princeton University, where he became the head of the Geology department in 1950 and in 1964 the sixth Blair Professor of Geology. Harry Hess died of a heart attack on August 26, 1969 in Massachusetts. Dr. Hess' most significant contribution to the plate tectonic theory began in 1945 when he was the commander of the U.S.S. Cape Johnson. While traveling from one destination to another, Hess would leave the sounding equipment on that would take measurements of the sea floor. It was at this time that Dr. Hess discovered features on the floor of the ocean that appeared to be mountains with the tops flattened. He called these features guyouts after the first Geology professor at Princeton. In 1953, Maurice Ewing and Bruce Heezen discovered the Great Global Rift and inspired Hess to reexamine the data that he collected while at sea. History of Ocean Basins was published in 1962 and explained the mechanism behind Alfred Wegener's continental drift theory. In the paper Hess described how hot magma would rise from under the crust at the Great Global Rift. When the magma cooled, it would expand and push the tectonic plates apart. This theory addressed many unanswered questions in the field of geology. One such question was why no marine fossils found in the ocean were more than 180 million years old, but older marine fossils could be found on land. Another question that seemed to be explained my Hess' theory was why there was so little sediment deposited on the ocean floor, even though the ocean was 4 billion years old. 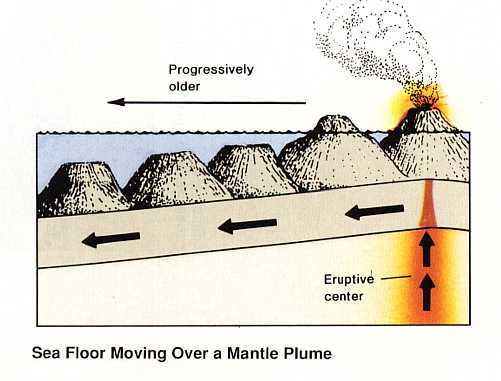 Hess explained that new crust was created at the Great Global Rift and was pushed under the continental crust about 300 million years later where it would melt and turn into magma. This motion also explained the formation of the guyots that were found at the bottom of the ocean. Hess theorized that these were once volcanic mountains that were moved and eroded over time. Despite the significant data, it wasn't until Vine and Matthews explained the magnet striping of the ocean floor and rocks from the ocean floor were dated that the evidence was available for Hess' theory to be accepted. It was discovered that the magnetic orientation of the rocks on the ocean floor alternated in stripes on either stripe of the Mid Ocean Ridge. At this time it was already known that the magnetic field of the Earth alternated periodically and if the ocean floor was all the same age then the magnetic orientation would be the same. It was also discovered that the youngest rocks were closest to the Mid Ocean Ridge and the oldest rocks were near the coasts of the continents. In 1962, President Kennedy appointed Hess to chair the Space Science Board, which advised NASA. Hess held the position until his death in 1969 and played a key role in the planning of the Apollo moon landings. One month prior to his death, Hess helped to analyze lunar rock samples from the Apollo 11 mission. Another important contribution that Harry Hess made to science was the organization and direction of the Princeton Caribbean Research Project. This project continues to explore the geology of the Caribbean region and has been the focus of several doctoral thesis. According to Hess, he failed his first class in mineralogy at Yale and was told that he had no future in the field. Over the course of his career, Hess was elected to several prestigious groups including the American Philosophical Society, the National Academy of Sciences, and the geological societies of London, South Africa, and Venezuela. Perhaps the most prestigious was the Academia Nationale dei Lincei of Rome, which is the oldest scientific group in the world. He was also the first geologist from the Western hemisphere to receive the Feltrinelli Prize from the ladder group. Beyond the world of geology Harry Hess was also an accomplished member of the Naval Reserves, where he earned the rank of Rear Admiral. After the attack on Pearl Harbor, Hess was called into active duty where commanded a submarine base. He soon developed a method of predicting the location of German U-boats and asked to be reassigned in order to use his method. From there, Hess became commander of the transport ship U.S.S Cape Johnson and saw action in four major combat landings, including Iwo Jima. It was during this time aboard the U.S.S. Cape Johnson that Hess used the sounding equipment on board to map the ocean floor.